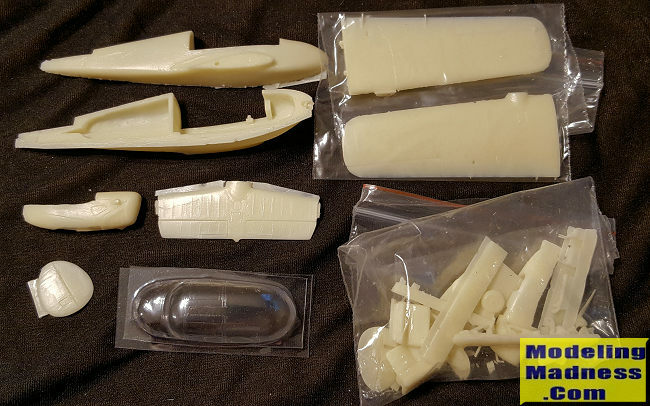 NOTES: Short run resin kit with vacuform clear parts and a small p.e. fret. The Miles M.65 Gemini was a British twin-engined four-seat touring aircraft designed and built by Miles Aircraft at Woodley Aerodrome. 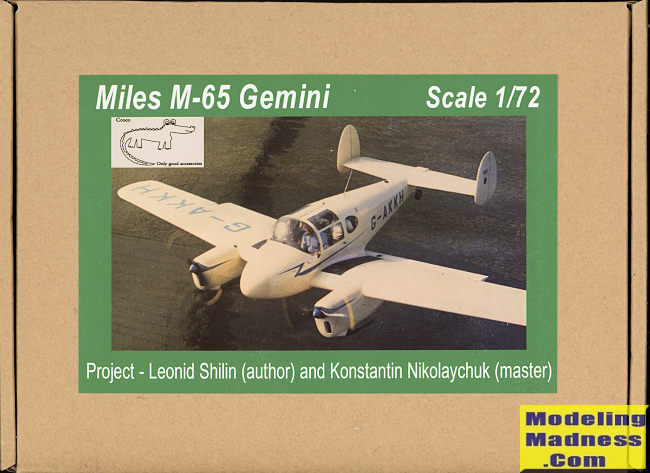 It was the last Miles aircraft to be produced in quantity. It was described by the manufacturer as the "safest light aeroplane in the world"
The aircraft was popular with private owners for touring throughout Europe and many were exported to Australia, New Zealand, South Africa and other Commonwealth countries. In the late 1940s and early 1950s they were frequently entered in air races, with G-AKDC flown by J.N. 'Nat' Somers AFC winning the 1949 King's Cup Air Race (a handicapped event) at 164.25 mph, this aircraft was fitted with de Havilland Gipsy Majors rated at 145 hp each. Several aircraft were used as light business transports by commercial firms including Shell-Mex and B.P. Ltd, Fairey Aviation and B.K.S Engineering. Other examples were flown by UK independent airlines on light charter work within the U.K. and Europe. After the collapse of Miles Aircraft in 1947 eight aircraft had not been completed and they were assembled by Handley Page (Reading) Limited at Woodley (two in 1950); Wolverhampton Aviation at Wolverhampton's Pendeford Aerodrome (five in 1951); and by F. G. Miles Limited at Redhill Aerodrome (one). Overall, 175 aircraft were completed and there are still quite a few flying today. This is another of Croco's interesting types produced in resin. It is not a large kit, but it is nicely detailed. The casting is quite good and fairly clean, though there are a few air bubble voids on the leading sections of the wings to deal with. This is quite typical with low production 'garage' kits and easy enough to repair. Note that I have not shown all the parts laid out, but just representatives so you can see the molding. You get a well appointed cockpit with two seats and control sticks that fit onto the cockpit floor. The throttle quadrant is molded onto the left fuselage half. A block for the main instrument panel completes this. Once installed and the fuselage halves mated, the vac clear section can be attached. This includes all the windows and windscreen. Two are provided if needed. Also included is a clear lens for the nose landing light. Landing gear are quite nicely done and appear to be fairly sturdy. The wings are a single casting on each side. I very much like that the engines and nacelles are molded as a single piece. There are two small photo etch pieces included (not shown). One is the pitot tube and the other is a large flap hinge. The actuator rod will need to be made from stretched sprue or a length of stiff wire. Props simply plug into the front of the engines, landing gear installed in the nacelels and then one can attach the wings, tailplanes and twin rudders. A tail strut and wheel complete the model. Instructions are hand drawn in several steps and are adequate to build the kit. 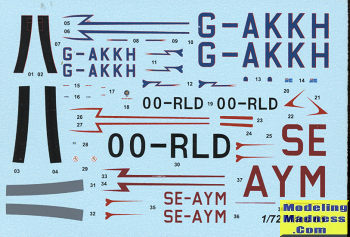 Markings are provided for three airplanes. All appear to be a general cream color. You have one with British registration, one with Austrian, and one with Swedish. I believe a 'net search will provide more information on that. The decals themselves are very nicely printed and you are also provided with wing walkways, which is a nice touch. it is great that folks take the time to mold kits like this. Due to its nature it is best for experienced modelers, thanks to the small parts. One thing for certain, when done, you will have a very nice model of a most unusual aircraft. Thanks to Croco for the preview item. Contact them at sniff23@inbox.lv for information and costs. You can also find these on ebay.